[click here for: Data and Methods Appendixes]. “Does Culture Still Matter? : The Effects of Individualism on National Innovation Rates” Written with Sean P. Wilson. Journal of Business Venturing 27:234-247 (Jan 2012). “International Linkages and National Innovation Rates: An Exploratory Probe” Review of Policy Research 26(1-2):127-149 (Jan/Mar 2009). “International Political Economy: The Reverse Salient of Innovation” Review of Policy Research 26(1-2):219-223 (Jan/Mar 2009). 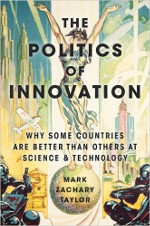 “Patents” in Science and Politics. Ed. Brent Steel pp. 423-428 (Sage/CQ Press, 2014). “Broadband Enabled Innovation” written with Michael Best in Trends in Telecommunication Reform 2012: Smart Regulation for a Broadband World. (International Telecommunications Union, 2012). “The Political Economy of National Leadership in Science and Technology” in Leadership in Science and Technology: A Reference Handbook. Ed. William Bainbridge (Sage Publications, 2011). “Politics and the Science of Science Policy” written with Harvey Sapolsky in Handbook of Science of Science Policy eds. John H. Marburger III, Kaye Husbands Fealing, Julia Lane, Bill Valdez, & Stephanie Shipp. (Stanford University Press, 2011). “Regression Analysis” (unedited version) in 21st Century Political Science: A Reference Handbook. Eds. John Ishiyama and Marijke Breuning pp. 478-489 (Sage Publications, 2010).